Many of you know that the Baltimore Concert Opera had its beginnings during a very difficult time for opera lovers in Baltimore. We began shortly after the former Baltimore Opera Company filed for Chapter 11 Bankruptcy, or protection from creditors. Soon after that, and much to our dismay, the storied BOC filed for Chapter 7, or complete liquidation. We formed the Baltimore Concert Opera as a way to keep people interested in opera, and hopefully, to reach a new audience…until grand opera returned. That time is NOW! 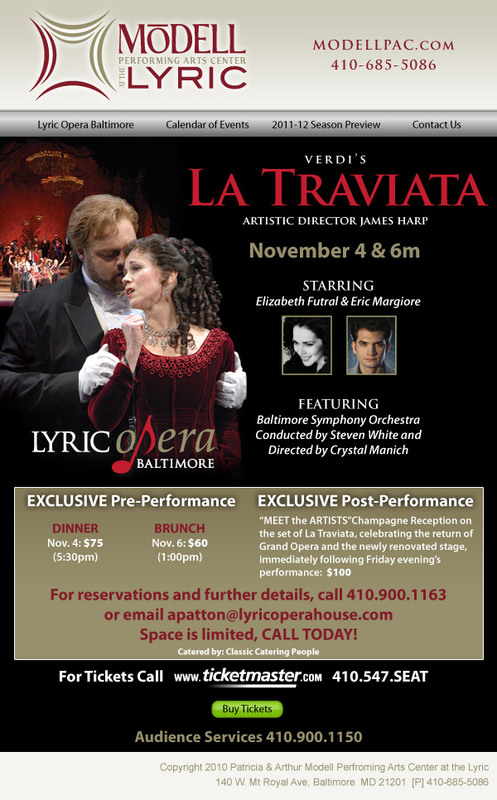 I’m personally over-the-moon to have the priveledge to be involved in Lyric Opera Baltimore’s innaugural production of La Traviata. For me, it truly is like “old home week,” with many friends who are downright giddy to return to their home-field. There is an almost indescribable positive energy surrounding this project, I feel it from the cast, the crew, the orchestra, and I’m all but certain that we’ll feel it from the audience this weekend. Take a look a who lost the most in the collapse of the Baltimore Opera Company. I lost a good bit of income as a member of the chorus, but nothing I couldn’t survive. Full time employees found themselves out of a job, many have landed on their feet elsewhere. One person, who in my mind was the heart and soul of the former company (no offense to the many other former employees that kept that company going!) is Jim Harp. Those that know Jim, know that he lives and breathes opera….it is not just a job, it is his life. A lesser man could have sunk into a deep depression, having the operatic carpet pulled out from under him…but Maestro Harp got to work….doing what he does best, bringing opera to the people of Baltimore. As one who has been fortunate enough to have a birds-eye view of rehearsals this week, I am comfortable stating that this production will not only be on par with what patrons of the former opera company experienced, it will be even more grand. If you haven’t already purchased a ticket, don’t miss your chance to get in on the ground floor with this exciting new company housed in familiar surroundings! So what does this mean for the Baltimore Concert Opera? We’ve learned in the past three years that we are much more than a “placeholder.” We’ve no intention of closing up shop now that grand opera is back in town…in fact, we plan to work harder, in order to help find a new audience for this art form that we love so much…these are indeed exciting times, please get involved! Just wanted to share our video introduction of one of the stars of our March performances. Enjoy! Full disclosure. I am a rabid football fan. I love watching my Baltimore Ravens. There are few times in the year where I really allow myself to unplug, kick back, drink a few beers, and not feel guilty about not working…Sundays in September – January, I’m your typical NFL fan. I love it. LOVE IT. Why? As our Baltimore Ravens go deeper into the playoffs, I’ll admit…it is absolutely fantastic to see a city rally around their team. I loved being here in 2000, when the Ravens won the superbowl. 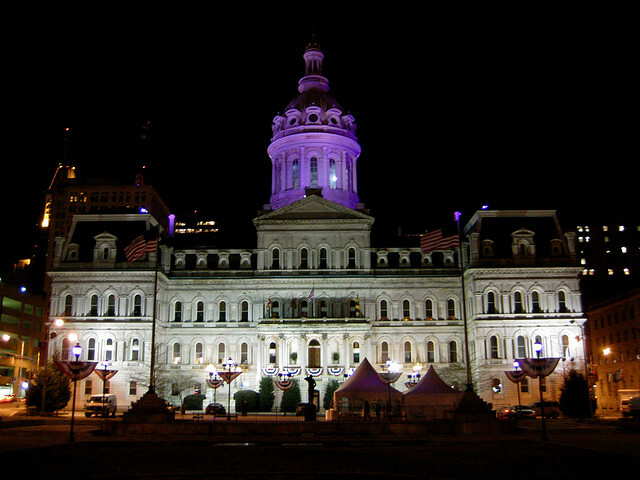 I loved seeing city hall, Penn Station, and other buildings all lit up in purple. I loved the attention that Charm City was getting on the national stage, and I can only begin to imagine the financial impact that a superbowl win has on our city. Where have we gone as a city when we can support a baseball team that has been a joke for years, yet our beloved opera company was allowed to crumble, over less money than many of these stars get paid in a week? Where have we gone as a city when the players in the Baltimore Symphony Orchestra (one of the world’s finest, I might add…year after year) are forced to take pay-cut after pay-cut, while the NFL players salaries climb through the roof? Granted, I do understand that the careers of some of these athletes are finite, and they need to make their money while they can. A ton of sacrifice, hard work, training (not to mention natural talent) goes into becoming a professional athlete. Well, same story with a classical musician…yet they seem to have even less opportunity. Take a minute. Go back to the top of this post. Re-read my disclosure. I freakin’ LOVE football, and I’m not suggesting that opera will ever have the same broad appeal as football…but shouldn’t we get some of it? that's a whole lotta seats! 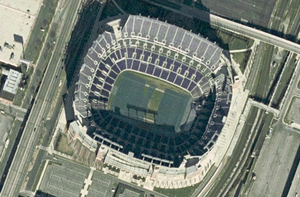 Ravens stadium seats over 70,000 people. They Lyric Opera House (which now bears the name of the former Ravens owner!) seats under 2,500. The new opera company that will be performing there, Lyric Opera Baltimore, will have SIX performances next year…15,000 people for a sold out season! The Ravens will have eight home games…and those 56,000 seats will sell out in a matter of minutes. Incidentally, Baltimore Concert Opera will have eight performances, and we seat 222 (and our tix start at $25). Am I suggesting that you give up football and support the opera? Heck no. I would like to steal an idea however from a new friend to the BCO, Dr. Tom Ritter. In a recent conversation, he told me that there is a rule in the Ritter house. If you are going to watch a Hollywood movie, you have to go see two live performances in your community. What a simple, yet incredibly powerful idea. Support the Ravens. Wear purple on Friday. Light your house up in purple. Go to games (if you can get a ticket). Then, go to the symphony. Go to the opera. Go to an art museum….tell your friends about it…or we might just not be here for your kids and grand-kids. Go support your team…but whatcha doin’ in the off-season? See you at the game, and hopefully at the opera! Recently, I posted a (perhaps) ill-advised status update on Facebook, marveling at what passes for classical music these days. It sparked a lively conversation about the general public’s perception of opera, and the idea that Paul Potts, Susan Boyle and Jackie Evancho might not be the most accurate representation of an opera singer. The sheer number of comments and types of comments that I received were quite interesting. Of course, a large percentage of my friends on Facebook have some sort of connection to the opera world, and their responses were as I’d expect…showing a great deal of frustration that the Boccellis and Boyles of the world are what the public thinks of as opera. I spoke about this very fact in a previous post about “vocabulary building” for opera fans, and again…Marcy Richardson’s short video (linked in previous post) is a perfect description of uphill battle that many singers and opera fans face. I was quite surprised by the backlash that my comments received from some folks. I was accused of being elitist. I was warned that in my current position as the general director of the Baltimore Concert Opera, I should think twice before posting anything that might offend our patron base. I’ve given this a lot of thought, and I’ve been able to clarify my thinking. I sincerely appreciate being challenged on this, because it has allowed me to spend some time really digging into what bothers me. I would take no issue if someone preferred to listen to Susan Boyle, or Andrea Bocelli rather than Joan Sutherland or Luciano Pavarotti. Truly, I would not (you should see what is on my i-pod!) They both seem like very nice folks. It is not the fact that people like to listen to these folks that bothers me. It is that the public is being told to listen to these folks, and being told that this is opera. Producers found the “everyman” characters that the public can relate to, and have thrust their moderately talented faces in front of the camera. A few short years ago, late night TV had some class…you’d routinely see real opera singers getting a fair shake…Robert Merrill, Beverly Sills, Joan Sutherland, appeared right after Elvis, or the Beatles. Why is it that today, opera is being represented in the public eye by those who are rather ill-equipped to represent it? One argument is that people need to “walk before they can run” when it comes to classical music. Of course, on some levels, I agree. I’ve written several posts on how opera takes a little investment on the part of the listener, and how a listener needs to gradually build their operatic vocabulary. My problem is that I do not think that a watered down “pops” version is a terribly effective way to bring people in….at least past the point of consuming watered down “pops” material. I don’t have any numbers on this (maybe someone out there does, and will share them with me) but I don’t think that pops/crossover material by singers and symphony orchestras ever really brings people in for the regular season. Sure, Josh Grobin has a pleasant voice…for once, I’d like to see Tim Mix appear right after him so that the public can make some decisions for themselves. Give the public something so extraordinary that they are compelled to find out more – Not : Give the public something pleasant, so that they can find some more pleasant, un-inspired garbage to listen to. Challenge people, and they might surprise you. Recently, I had some hope that television producers might be getting it right. There was a lot of buzz about a project called LONESTAR OPERA, which chronicled the off-stage lives of some opera singers (including our pal, Michael Mayes). LONESTAR OPERA was getting a lot of attention, until sadly, the good folks at the BRAVO network (remember when they used to show operas?) found that there was no room in their programming for such a show…I suppose they’d have had to bump the real housewives of who-cares-where in order to make room. This would have done wonders for the opera world…for the public to get to know characters like Michael off-stage….sadly, we’ve got to find another way to get the word out! Michael has picked up the gauntlet, and taken matters into his own hands with THE TEXAPOLITAN OPERA, I encourage you to sign up for his hilarious podcast, if you have any interest in the seedy underbelly of the opera world! Opera singers…perhaps we can all follow Michael’s lead? Hollywood thinks that the American public is more interested (in some cases) in the story than in the talent. How can you tell your story? There are some great stories out there about football players turned opera singers (looking at you Mark Rucker) and bounty hunters turned opera singers (recent NYTimes article on Carl Tanner’s Met debut) what’s your story? How did you get here? Why do you devote hours of daily study to an art-form that the general public seems to be losing interest in? What are you going to do to help? You are some of the most interesting people I know….get to work. Adam Hall’s tenor-dad blog is a pretty colorful commentary about the trials and tribulations of a stay-at-home-dad-when-he’s-not-traveling-and-singing opera singer. Any other fun things I’m missing? OK, so maybe my thinking on this subject isn’t as clarified as I thought….this post sure rambled on! As we forge ahead in our second full season and watch the operatic climate change in Baltimore before our very eyes (see previous post about opera in Baltimore) it is as important as ever for us at the BCO to be not only aware of our surroundings and how we fit in, but to remain true to our artistic vision or mission. This has been refined over the past two years, but the core principals have not changed. Our mission is to build an audience for opera. Yes, of course, we want to sell all of our tickets, all of the time. Yes, we want to obtain funding to continue doing what we do. Yes, we want the support of our patrons and the public at large…and we are willing to fight for it, because we believe in what we do. It’s as important now as it has ever been, to remain true to what we are, and to not attempt to be something that we are not! Some may wish for more acting, costumes, less time behind music stands, etc. Our answer to that will have to always be…there’s a company for that! Once you’ve enjoyed an opera in the intimacy of the ballroom at then Engineers Club, we encourage you to check out all of the other operatic offerings that Baltimore has to offer! Our approach is one “take” on how to get people hooked on opera. We focus on what we think is the one essential element, the human voice. We’ve been told by more than a few patrons that the format is so compelling, you almost don’t notice the missing elements. We are not a grand opera company, a chamber opera company, a cabaret company. What then, are we? We are a vocabulary builder. For the person who has never been to the opera before, we are a safe, comfortable, relaxed place for them to become familiar with operatic vocabulary. What do I mean by that? Previous generations grew up with at least some exposure to this art form (think Ed Sullivan show). Today, Joe Q. Public is bound to tell you that Paul Potts or Jackie Evancho are their favorite opera singers. This is because, for whatever reason, they lack frame of reference. This is not meant as an elitist statement, but it is really difficult to appreciate something that you don’t understand. For a hilarious commentary about this scenario, please watch Marcy Richardson’s short video on YOUTUBE. I love opera because I speak the language. I understand the musical vocabulary. I can appreciate Strauss’ Salome or Shostokovich’s Lady MacBeth of Mtsensk, not because I am brighter than the average person (believe me, I’m not! )…but because I have the vocabulary. In a previous blog post I wrote about how becoming an opera fan takes an ivestment of time and energy. This is because the general public does not hear this music in their daily lives. Whether it is conscious or not, we do grow up with a musical vocabulary. We hear rock and roll on the radio, on TV, in elevators. Regardless of whether or not we can analyze this music, identify and verbalize a standard I-IV-V rock and roll chord progression, we all KNOW it. It is in our subconscious comfort zone…it’s almost part of our DNA. That’s why popular music is popular, in my humble opinion….it’s easy. What we offer at the BCO is a place to build your operatic vocabulary. If you’ve seen Tosca one hundred times, we’re pretty confident that you’ll learn something new in our intimate setting. If you’ve never seen it before, you will have an opportunity to be exposed to real people, in an up-close and personal setting, serving up this score to you on a silver platter. You won’t have the benefit (or the distraction, some might say) of the sets, costumes, lights…you’ll get to focus on the glorious music, and the sheer beauty and power of the human voice. This is how we believe we can help grow an audience for opera in Baltimore, and beyond. Vocabulary building. It is a wildly exciting time to be working towards our mission, and to be seeing the results. There’s nothing quite like the feeling of being approached by someone after one of our performances who has never been to the opera, only to have them tell you that they cannot wait for the next one. See, they are building their operatic vocabulary. Hopefully we can help them continue their exposure to the wonderful world of opera, and they’ll be less threatened by the idea of attending grand opera in the larger theater…that person is building their operatic vocabulary, we’re building an audience for the future. There has been a whole lot written recently about the state of opera in our fair city. Many major publications have picked up on the story, and it almost seems as though grand opera gets more attention when it’s something that we had, rather than something that we have. It seems that some are more interested in the drama behind the stage than on it, and I suppose that is OK if we subscribe to the theory that any press is good press. Here’s my concern: For those (press and general public) who have been bemoaning the loss of the Baltimore Opera…when are we going to get over it? When can we move forward? It was two years ago. Believe me, I personally lost a whole lot more than the average audience goer, as did many of my colleagues. I lost a job, an income, a sense of community…not just a place to go see the opera. But, we got to work…immediately. We began producing our reduced format opera as a way to keep audiences interested. We never miss a chance to promote the efforts going on to bring grand opera back to Baltimore’s Lyric Opera House. What are you doing? Will you be there to support the Lyric as the curtain opens next November? Yes, NEXT November, that’s how much planning goes into these ventures…they don’t happen overnight. Will you commit to attend performances? Will you grasp the idea that ticket sales cover less than half of the cost of putting on an opera, and search for ways to keep the new company in a healthy financial state? Or, will you wait until it is gone again, so that you can complain about the loss of another company? We at the BCO are doing our best to grow the audience for an art-form that we love. We’re grateful for the press we’ve received, and for the generous donations that have kept us afloat for two years. We’ve consistently reached younger, newer, different audiences than we are accustomed to seeing at the opera, and that keeps us going…gives us hope…for the future of opera in Baltimore and beyond. If opera dies on our watch, it won’t be due to lack of CPR. My hope is that when the curtain goes up at the Lyric next November, the same press that was there to cover the demise of the BOC, the same press that has highlighted the “scrappy” little companies that have cropped up in its absence, will be there to welcome in a new day of grand opera in Baltimore…perhaps they’ll even notice the changing face of the audience, due to the hard work of the “scrappy” little companies! I know that I’ll do everything that I can to help promote and support a grand opera company at the Lyric. It will be hard not to think of the wonderful memories of the good ol’ days, as well as the hurt that followed with the loss of the BOC, but my eyes will be looking forward…not back. Many thanks to Dale Keiger with Johns Hopkins Magazine for his article on the state of opera in Baltimore (especially those ventures with Peabody connections). His article is perhaps the most accurate, well written, and optimistic account of the Baltimore Opera scene. Other recent articles by Tim Smith with the Baltimore Sun, and a feature in Baltimore STYLE magazine, have helped to draw attention to the opera scene in Baltimore. If you want to know more, subscribe to BaltimoreOpera.com which was purchased at the BOC bankruptcy auction and now functions as site devoted to all opera in Charm City. Bring your friends, get involved, don’t wait for someone else to do it…then there’s no reason that this great city can’t support all of these worthwhile ventures.